Couple of days ago I came across a fantastic challenging application in Facebook which is called “click test”. 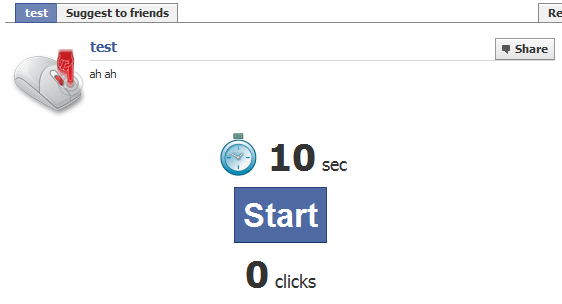 This application measures your click per second and you have to click as much as you can in 10 seconds. For sure in my 130 friend there are many who can click more than me, but I had to do my bests especially a friend of mine (Kambiz) who is not only good at typing and clicking but also good programming. What should I do! should I left the battle or keep challenging? Of course I have to stay in this battle. I tried to score a good click per second but honestly the best I did was about 90 clicks per second which is lower than lots of my friends. Ok to find start button you can press Ctrl+B or select Find -> Select element by click. Then move your mouse to element that you want inside browse. As soon as you move your mouse inside browse you’ll notice that browser mark current element by bordering it. So find start button and then click on it. Gotcha! Developer tools automatically scrolls to input tag related to selected element. You can also scroll horizontally to find “onmouseup” which is actually responsible for counting your clicks. Ok, double click inside onmouseup and then press Ctrl+A to select all body of onmouseup. Actually this is an event handler and this code runs every time you click on your mouse button. But it’s rather complicated. It calls a function at first and then calls another function. So If I want to change this code I have to find these functions and then change body of them. But what if I don’t change any code and just make this event handler to run multiple times per click. That is sound good idea. So let copy and paste event handler for couple of times. But I should notice that second function call has “return” and I have to remove it for my new copies, and just leave it for last one. As you see I copied all code for three times and left return just for last call. It means my clicks will be tripled and I can register 150 clicks just for 50. It’s good. So let’s copy this code back to onmouseup element it is ready for testing. First of all you have to create an ASP.Net AJAX-Enabled Web Site named "EmbededJSTest" and add System.Web.Extensions references to project . In order to add this assembly you have to install ASP.NET AJAX 1.0. Add another Web control library project to solution named "EmbededJSControl". Add project reference of "EmbededJSControl" to "EmbededJSTest". In property page of this file change the value of "Build Action" Property to "Embedded Resource". Save file and close this file. Execute project and click on Hello button. By applying this method in your Web Control projects there is no need to release js file with assembly dll’s.